700,000 American households don't have transit access and don't own a vehicle, according to a new study from Brookings Institution. Photo by Mr. T in DC. The Brookings Institution released a new report, “Transit Access and Zero-Vehicle Households,” examining public transport access and its relationship to vehicle ownership. The report reveals that 700,000 U.S. households don’t have access to public transport in their neighborhood and don’t own a vehicle. In exclusively looking at zero-vehicle households, Brookings found that more than 7.5 million households (or 10 percent of households) in the country’s largest 100 metropolitan areas don’t own a car. Data for the report was provided by the American Community Survey and the 371 transit providers that service the nation’s biggest cities. The report also looks at zero-vehicle ownership and transit access in the context of cities versus suburbs, various geographic regions, and social equity demographics, such as race and income level. “Zig-zag” pavement markings increase driver awareness, according to a new study featured in this month’s issue of Spokes magazine. The study, “Best Practices in Traffic Operation and Safety: Phase II: Zig-zag Pavement Markings,” investigated the effect of zig-zag road markings placed in the middle of driving lanes on driver behavior. The road markings resulted in increased driver awareness, as indicated by reductions in vehicle speeds. Respondents polled on their experiences with the pavement markings reported an increased awareness from the markings and a higher tendency to yield than before. The zig-zag markings were painted on roadways in advance of two road crossings by the Virginia Department of Transportation at the Belmont Ridge and Sterling Blvd crossings of the W&OD Trail. The life cycle environmental impacts of various modes of transportation are analyzed in a new report, “Life Cycle Assessment of Transportation Options for Commutes.” The study concluded that human-powered modes of transport are much less polluting than those involving fossil fuels. The study also found that there are no significant differences between the environmental impacts of walking, conventional biking, and electronically assisted biking. Although electronically assisted bikes require more fossil fuels to produce and operate, they require less human exertion than conventional bikes or walking, and thus result in similar energy consumption, the study says. A joint survey conducted by the National Association of Realtors (NAR) and real estate consultancy RCLCO examined housing preferences in relation to transit. According to a survey of 2,000 people last February, 23 percent of Americans want to live within walking distance of rail transit, and 47 percent of individuals would like to live in a downtown area, an inner-city residential neighborhood, or a suburb with shops and amenities within walking distance. 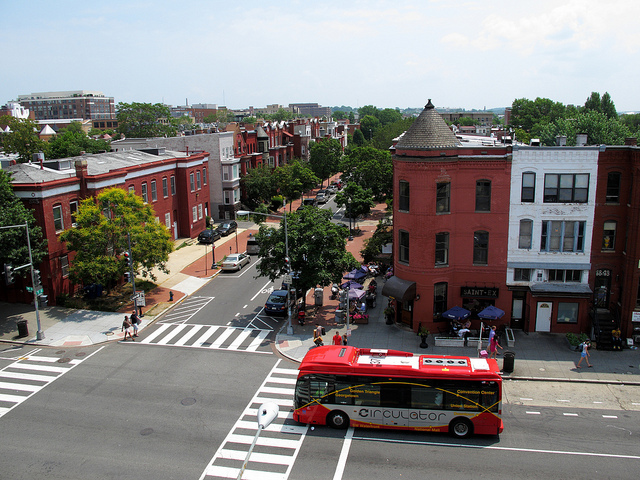 These preferences stand in contrast to current conditions, as in the greater Washington, D.C. area, for example, where only 14 percent of residents live within a half-mile of Metro services. The study also uncovered that 59 percent of individuals would choose a small house and a shorter commute over a big house with a longer commute. The study also explores participant demographics as they relate to preferences and finds that, contrary to popular belief, transit priority in relation to housing is not limited to young professionals.